Slack’s a great tool for distributed organizing. But you have to lay the groundwork. The #announcements channel is a great place to put important announcements for your team, such as all-team meetings, important press clippings, and other operational announcements. You should keep your #announcements channel low-volume. Make sure you only use it for things everyone really needs to know, so your team will be more likely to pay attention when you do post! An #announcements channel is a great way to update your team on important events and, well, announcements. Public channels are accessible and and can be joined by any member in your Slack team. Private channels can only be accessed by people specifically invited to the channel. Additionally, private channels will only show up in the channel directory by people who are already in the channel. A note — when you add a new member to a private channel, it will ask whether you want to allow the new member to see the previous messages or not. If you do not want the new member to see old messages, it will create a completely new private Slack channel with the same members in it but no message history. Otherwise, the new member will be able to see channel history and everything saved in it. Which channels should be public, which should be private? A channel that could pertain to anyone — including campaign updates, general information, or volunteer efforts, would be good as public channels. Channels for campaign staff only or regarding sensitive topics, such as security or data management, would be good as private channels so that only those that need to have that information are able to see it. 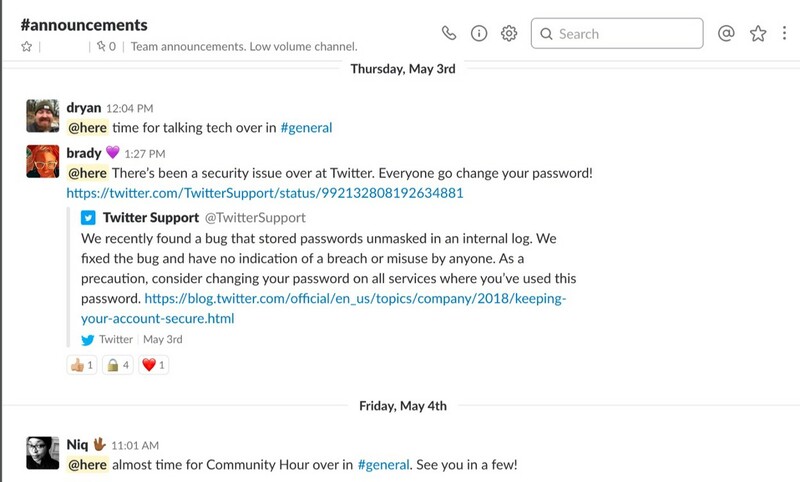 Check out this Slack support article on how to create channels, and how to set them to public and private. Pro tip: Consider making all the channels private channels! This can help make sure people can see what they need to, but not see what they don’t. #announcements: A locked-down channel where only admins can post. Great for important announcements everyone needs to see. #general: The general chit-chat channel. Great place to ask questions that are related to the work you’re doing. #random/ #off_topic: Everyone’s got a life outside of their job (or their activist job). The Random (or Off_topic) channel is a great place for folks to post about weekend plans, pictures of their grandkids, and hilarious news clips. #data_captains: Create a private channel for your data captains to coordinate their work. They can coordinate schedules, share best practices, and VAN tips and tricks. #phone_bank_captains: A private channel for phone bank captains will give them a place to talk about their work — share the ups, commiserate about the challenges, and work together to find solutions. #phone_bank_central: A private channel for all the folks working on your phone bank can be a great way to build a sense of community that spans from one phone bank to the next. It is especially great if you have folks phone banking from home, or if you have different phone banks in different locations. #door_knocks: A dedicated canvassing channel is a great way to let people share their exciting wins while canvassing. Because Slack has great mobile apps, it’s easy to keep in touch with the whole team on the go. You can also use this dedicated channel to send announcements or alerts to all your canvassers at once. #motivation: Organizing is hard work, but super rewarding! Sometimes you just need a little bit of a boost. A motivation channel is a great place to send happy gifs, quotes, and share stories to help motivate your volunteers. It’s great to be able to check in to a motivation channel when you need that quick boost. #press: Collect your press clippings in one channel, for your team to share with their networks. #help_wanted: Need some help? Of course you do. This is a great place for the field office staff and the volunteers to post things they need help with. Need someone to staff an event? Need the trash taken out? Need some bonus 1:1 training on phone banking? Post it here! #talking_points: Keep your team on message! Post important talking points in this dedicated channel. From time to time, you may want to get rid of a channel. There are two different options to do this — archive and delete. Archiving a channel removes all members, disables sending messages, and removes the channel from the channels list, but it is still viewable and searchable. To archive a channel, simply type /archive as a message. Archived channels can be viewed in the channels list by changing Show: All Channels to Show: Archived Channels. Deleting a channel is a bit different. It is a more permanent option. A deleted channel is not searchable by the members of your slack, but keep in mind that it will not delete files that were sent in that channel. To delete a public channel, click the gear icon in the upper right corner of the channel and go to additional options. Non-administrators do not have permissions to remove channels. For more instructions on deleting and archiving, check out Slack’s own guide here. Level up with our next article: 6 Steps to Better Digital Security with Slack. Check out our intro to Slack for organizing: What is Slack, and Should We Use It?